Just because your guinea pig's heartbeat is moving fast doesn't mean there's trouble ahead. This is especially true if you don't notice any other signs of illness, such as changes in appetite, diarrhea or lethargy. 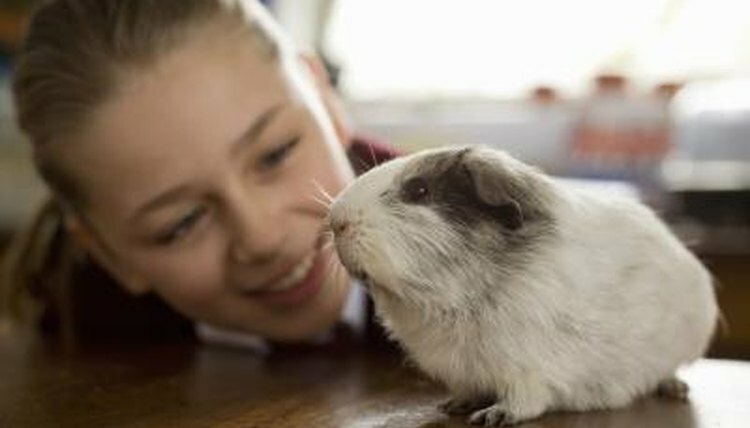 If you suspect your guinea pig might have a heart problem, take her to the vet as soon as possible so she can be treated. Guinea pigs have a fast heartbeat even when everything's well and they are healthy and strong. In fact, their normal heart rate is 240 to 250 beats per minute. That's somewhat close to cats, who have heart rates of 160 to 240 beats per minute. Dogs, on the other hand, don't have normal heart rates higher than 160 beats per minute. Hyperthyroidism in guinea pigs can cause a speedy heart rate. If you're used to your guinea pig's fast heart rate and you suddenly notice it's faster than normal, look for other signs that hyperthyroidism could be present. Common symptoms include an increase in appetite, increased thirst, constant activity -- your guinea pigs is awake and moving longer than usual -- and more frequent urination. A fast heartbeat can be a sign that your guinea pig is under stress. During times of high stress, guinea pigs might become irritable and more likely to bite. They might also refuse petting or want to be left alone. Some might even hiss or bare their teeth to warn that you should stay away. Heart problems are pretty common in guinea pigs. Unfortunately, a lot of people don't realize their guinea pig is sick until the problem is serious and hard to treat. A rapid heartbeat could be a sign that the heart is working harder than usual to pump enough blood or oxygen through the body. Other signs of heart disease include difficult or fast breathing, respiratory infections that seem to come back regularly despite treatment, excessive salivation and sleeping too much. Always consult an experienced veterinarian regarding the health and treatment of your pet.